Released in conjunction with the exhibition "Feminism and the Artist's Book," this issue's catalog explores the historical and aesthetic ties that feminism has to the book medium. Nanette Wylde discusses gender issues and their impact on her art while Melissa Potter shares insights into her recent work, "Gender Assignment." Nina Pelaez grounds the work in an historical context, tracing the symbiotic relationship between women and the print and book forms from their earliest manifestations into the present day. 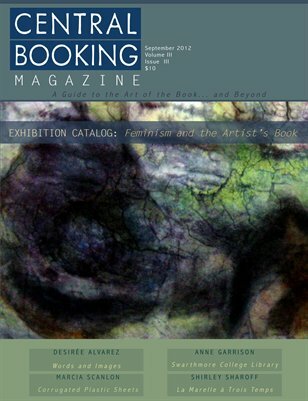 Also in this issue, Desirée Alvarez shares her insights on the interplay of word and image in her art. Anne Garrison writes about the evolution of the book collection at Swarthmore College; Marcia Scanlon shows us how to use an ordinary found material to make book covers, and even sculptures. Omar Olivera contributes a graphic piece using collage and icons of consumerism and Shirley Sharoff shares a bi-lingual excerpt from her book, La Marelle à Trois Temps.